The Quinnipiack Valley Health District is one of six health departments in the state working with the Department of Public Health on the CORE initiative. Accidental drug overdose is now the leading cause of death for Americans under 50, with more than three out of five overdose deaths involving an opioid. According to the CDC, drug overdoses killed more than 70,000 people in the United States in 2017, with 1,076 taking place in CT alone. The Opioid Epidemic was declared a national public health emergency in October of 2017. In March of 2019, the CT Medical Examiner reported there were 1,017 overdose deaths in the state in 2018. See below for everything you should know about Opioids, Naloxone- the Opioid Overdose Reversal Drug, How to Reverse an Overdose, Risk Factors & Treatment Options for Substance Use Disorder. Opioids are a class of narcotic medications that a doctor may prescribe to relieve pain- Oxycontin, Codeine, Morphine, Vicodin, Demerol & Percocet are all legal medications. Illegal opiates include street drugs like Heroin and synthetic opiates, Fentanyl & Carfentanil. While pain relievers are generally safe when taken for a short period of time, under a doctors supervision, they are frequently misused. Regular use of these pain killers, even when prescribed by a doctor, can result in dependence. Opioids are designed to relieve pain, but when taken in excess the body's automatic drive to breathe is diminished. Mixing an opiate with alcohol and/or benzodiazepines, can be fatal as these substances also slow your respiratory system. Fentanyl, a synthetic opioid 100 times more potent than morphine, is a major driver of recent opioid overdose deaths. Fentanyl is responsible for at least half of the 64,000 deaths that occurred in 2016, because it is often mixed into drugs like heroin or cocaine without warning. Getting the RIGHT help for Opioid Dependence or Withdrawal- important things to keep in mind- click here! What is Naloxone (also known as Narcan)? Naloxone, also known as Narcan, is the lifesaving opioid overdose reversal drug. It is a short acting medication that can reverse a lethal dosage of opioids by temporarily blocking the effects of the drug. This revives the person, allowing time to access medical attention. 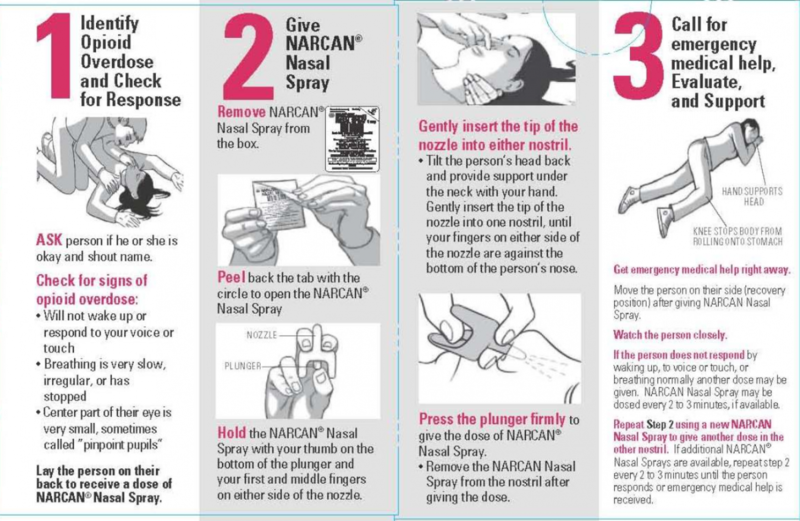 Narcan can be administered into the muscle or as a nasal spray, which is fairly simple to administer. The price of Narcan varies depending on the source. With insurance coverage, most customers end up paying a small co-pay between $10-$25. Naloxone is available to anyone who wants it. Friends, neighbors, family members are encouraged to receive training and carry a kit. Naloxone Nasal Spray is the version you will typically receive from a pharmacist or community distributer. Naloxone comes in two forms, one which requires assembly. Watch the videos below to become familiar with the medication, to learn how to use the Nasal Spray’s and clarify any questions or concerns. Naloxone has little, to no side effects if administered in error. Naloxone is harmless because it will only function when an opioid is present within the body. Naloxone is now available to everyone; the following pharmacies are certified to prescribe to those who ask. The pharmacist will review signs of an overdose and how to properly administer Naloxone right at the pharmacy. Most insurances cover the medication for a small co-pay. New Haven Syringe Exchange Program: Yale’s School of Medicine’s Community Health Care Van is a mobile medical clinic that provides primary care services along with a variety of others. Services include free Naloxone kits, clean needles, substance abuse treatment, and mental health services. The van travels around New Haven, aiming to reach the uninsured/under-insured populations. Patients are seen free of charge and no appointment is required. The van’s schedule is listed below. Visit www.chcv.org for more information! QVHD will continue to host training events within our four towns of Bethany, Hamden, North Haven and Woodbridge. To date we have trained over 150 community members on how to reverse an overdose and therefore, save a life. Everyone is encouraged to get trained. Stay tuned for upcoming training dates, follow our twitter account: @QVHD or Facebook page @ Quinnipiack Valley Health District for the latest news. With the goal of saving lives, a law known as the 911 Good Samaritan Act was passed in 2011 aiming to persuade people who may be reluctant to contact emergency personnel when witnessing a drug overdose. The law protects individuals who reach out to authorities, giving them immunity despite the presence of illicit drugs or paraphernalia present on the scene. In 2014, the law was expanded to protect the individual administering Narcan from civil liability & criminal prosecution. *Note: The Good Samaritan law does not protect someone from other charges or pre-existing warrants. Tip: Always call 911 before administering Naloxone so medical attention can be provided in a timely manner. An individual can overdose again, the effects of Naloxone wear off 30 to 90 minutes after administration. If no response - Call 911: Provide as much information as possible including an exact location, if the person is breathing, or if they’re having trouble breathing. This makes the call a priority. Substance Use Disorder is recognized as a chronic brain disease caused by a combination of behavioral, environmental and biological factors. Like cancer and diabetes, substance use disorder requires treatment. Providing support to people with substance use disorder is critical. Stigma, the negative perception commonly associated with addiction, often prevents people from seeking help. Addiction is a treatable, chronic disease that can be managed successfully. Multiple evidence based approaches have been identified. The Substance Abuse & Mental Health Services Administration (SAMSHA) has a National Helpline, open 24 hours a day, 7 days a week. Call 1-800-662-HELP (4357) or 1-800-487-4899 for free and confidential information, available in English & Spanish, for individuals and family members facing substance abuse and mental health issues. The Department of Mental Health & Addiction Services (DMHAS) also has a help line open 24/7, 365 days a year that provides screening and referalls to appropriate levels of care to clients who are uninsured or those on state medical insurance. The service communicates with treatment providers and even arranges transportation services for detox, if necessary. Call 1-800-563-4086 for more information. Click here to view Daily Bed Availability for various Detox Programs, Residential Treatment Programs & Recovery Homes provided through the Deparment of Mental Health & Addiction Services. The site is updated daily. Clifford Beers "Creating Community" Group is for friends & family members (16 and older) who have a loved one struggling with substance addiction. Beginning on November 1st, the group will be held every Wednesday from 5:30-7:00PM at 93 Edwards Street, New Haven. Click here for more information. Addiction & Mental Health Support Group. The first Tuesday of every month at Mildred A. Wakeley Community & Recreation Center, 7 Linsley Street, North Haven from 6:30-8:30PM. The group is open to anyone seeking support including non-residents, groups are free of charge. Co- Facilitated by Shalyn Rose, LCSW 203-376-0220 & Lauren Goodkin 203-584-0366 Click here for more information! Nar-Anon, A 12 Step Support Group for Friends & Families of Addicts "Courage to Change" December Schedule: Thursdays 7:00PM Harborside Health Care-Arden House, 850 Mix Ave (Board Room) Hamden, CT Contact: Rose (203)-641-9380 or Maxine: (203)-215-6961 Click here for their website. Mondays: New Haven Living Clean, 7:30PM-8:45PM at Church of the Redeemer, 185 Cold Spring Street, New Haven, CT.
Tuesdays: The Masks Have To Go Group, 6:30PM at Montowese Baptist Church, 201 Quinnipiac Avenue, North Haven, CT.
Hope Without Dope, meets 7:30-8:30PM Tuesdays at Grace & St. Peter's Episcopal Church, 2927 Dixwell Ave, Hamden, CT.
Fridays: Right Step into the Weekend, 12:00PM Episcopal Church of St. Paul & St. James, 57 Olive Street. Corner of Chapel Street, New Haven, CT. The Children's Center of Hamden, 1400 Whitney Avenue, Hamden CT, 06517, (203)-248-2116 Open Monday-Friday 8:30-5:00pm. Wakeman Hall's Substance Abuse Treatment program provides outpatient treatment, intensive outpatient treatment, and community based after care for teens 12-17 years old. Click here for more information. The APT Foundation has multiple locations around New Haven. All Locations are accessible via CT Transit Bus system. Central Call Center Number: (203) 781-4600 Open: Monday – Friday 5am-3pm, Saturday 6am-3pm select locations. APT provides both outpatient and intensive outpatient treatment, primary health care, outpatient Medication Assisted Treatment, family counseling, mental health services and adult education/vocational services to men and women 18 and older. Admission is on a first come first serve basis, must be seen at the Access Center (1 Long Wharf Drive) to become a client. 1 Long Wharf Drive- New Haven – Walk in Access Center Hours: Monday- Friday 8:30am-11am. A typical OD victim in CT in 2016 was a non-Hispanic white male between the ages of 30-59 who was using opioids, probably fentanyl/heroin & other substances. On the day he overdosed, so did two other people. Clean out your medicine cabinet as often as possible and properly dispose of any left over or expired medication. Take advantage of national medication take back events that occur locally, typically on the 3rd Saturday of April & October each year. Never flush medications down the toilet, they can cause water pollution and negatively affect the environment. Watch this video from the Department of Mental Health & Addiction Services to learn more about proper disposal of meds at home: click here! Safely dispose of unused drugs by dropping them off at a local medication drop box. These boxes are located in the lobby of Police Stations and are typically open 24 hours. Pick up a Medication Deactivation Pouch from Quinnipiack Valley Health Districts front lobby (limited supply). The environmentally friendly disposal pouches allow residents to safely dispose of leftover drugs in the comfort of their own home. This publication was made possible by the Centers for Disease Control and Prevention (CDC). Its contents are solely the responsibility of the authors and do not necessarily represent the official views of the CDC.